Hurricane Harvey…Where do I even begin to talk about the devastation that they state of Texas has endured. I’ve lived in Houston all of my life just about and in the most recent years it just seems like the city itself can’t handle a heavy rain. I don’t know if it’s the drainage system or the constant building and growing of Houston but we really have a serious problem. In the video below by Chase Boogie, you see Highway 288, a major freeway looking like a lake. This is one of the freeways that I would normally take to get to Downtown Houston. Downtown Houston is totally flooded with no place for the water to even go and then they have levys that were released which added to more devastation of communities. People lost their lives, whole families in vehicles trying to escape were stranded in water, I have friends who have lost everything and only escaped the flood waters with the clothes on their back. It’s really devastating and emotional to even be in Texas right now. Looking at the news and seeing Facebook of people reaching out to be rescued, people on the roofs of their homes and apartment complexes, doing welfare checks, alerts on my cellphone and alarm system going off every 5-10 minutes because there is a tornado in the area and having to take shelter in the closet but not alarming my 4 year old so that he would still feel safe; it was a lot. The gas shortage partnered with lines to get into the grocery stores, fights + hopelessness once you finally get in there and the shortage of food and water. I wouldn’t wish this experience on any one but I still love my city. My immediate family had no damage to our home or vehicles. The video below shows how the highest the water got was midway covering my driveway with the neighborhood being totally flooded of not being able to get in or out. 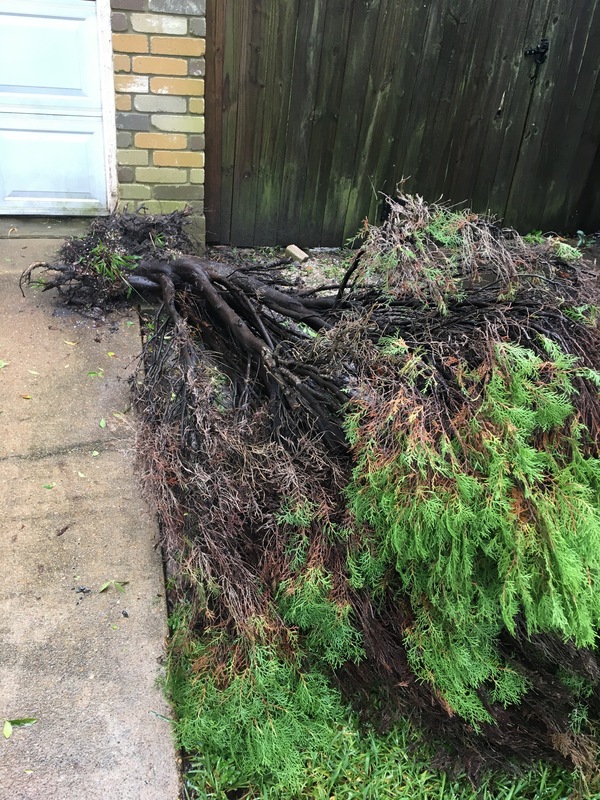 My mom had some uprooted bushes and trees, a couple of roof leaks at her home, and no power for about 16 hours but there was no flooding on her street. My Grandmother on the Northside of town in Fifth Ward had no water damage but was with out lights for 5 days and the freeways were flooded so no one could get to her. My Cousin Crystal had a couple of inches of water in her home but her family is safe. The water was up passed my Aunt Yvonne’s knees in her house and once she went outside for rescue, the water was to her chest; she has the most damage of the entire family. With school being out for about 2 weeks, there’s only so much you can do with kids in tow as the shelters aren’t allowing kids to volunteer. I cleaned out our closets and donated over 60 items of clothing and toys. Since my Aunt was affected the hardest, Clark and I bought her a bucket full of clean up products and she was so appreciative.